Figure 14.10 The York boat (on which the York/Columbia Express depended) is descended from the yole, a type of fishing boat found in the Orkney Islands, from where many HBC servants came. The yole, for its part, is descended from Viking boat design. 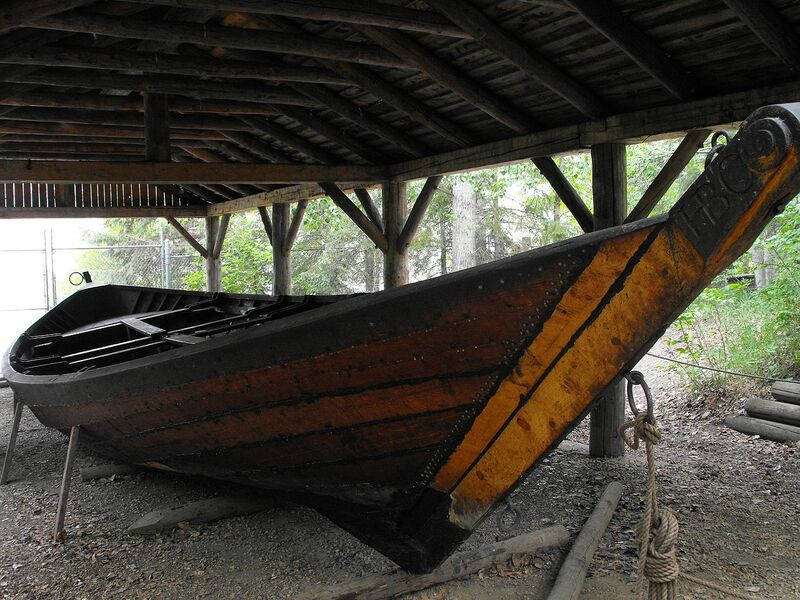 The York boat has elements of design continuity that stretch back from the 19th century to the time of Vinland and earlier. 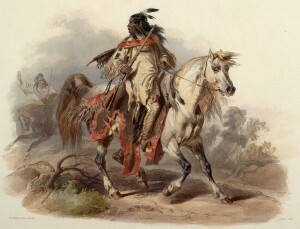 Figure 14.11 This mid-19th century representation of a Blackfoot warrior suggests the timelessness of the mounted Plains culture. But that culture was, itself, only a few generations old when this image was created. 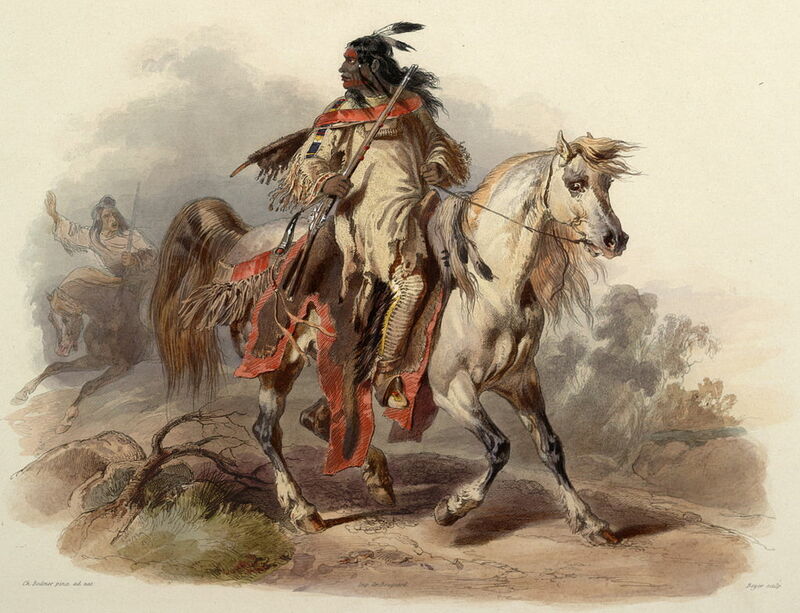 (Painting by Karl Bodmer, ca. 1840-43). Who were the people of the new Dominion? Negotiations took place between colonial leaders and ignored Aboriginal peoples entirely, as well as the Métis. As a mechanism for expediting business transactions between colonies/provinces and creating administrative efficiencies, Confederation held out some promise; as a representation of the aspirations of the people across most of the territory to which it laid claim, it must have seemed baffling. What’s more, the “people” were a moving picture, not a photograph. They were being changed by forces many could not yet see. Industrialization and urbanization were the foremost of these. In a matter of a few years the typical Canadian life course would include living in growing and industrial cities and working for wages. The majority of Canadians would continue to live on the land for another 60 years, although some provinces would cross the threshold into being principally urban much sooner. In other words, the impression is inescapable that the people for whom Confederation and all its aspects was crafted would soon be overwhelmed by a different society. The extent to which a united British North America would recognize and serve well the interests of those people, those Canadians, is the test that lay ahead in the post-Confederation period. Charlottetown Conference: Convened by the leaders of New Brunswick, Prince Edward Island, and Nova Scotia for the purpose of discussing Maritime Union on September 1-9, 1864; discussed the possibility of a union that would include the Province of Canada. Laid the groundwork for the Quebec Conference. Council of Assiniboia: An unelected council created by the Hudson’s Bay Company in 1835 for the administration of Rupert’s Land. double majority: In the Province of Canada, an attempt to break the gridlock under the 1840 constitution by means of multiple majorities: a majority in the 84-seat assembly was required along with majorities in the Canada West and Canada East segments of the assembly (42 seats each) for a bill to pass into law. half-breeds: A term that was once descriptive but soon became pejorative to describe individuals whose ancestry includes both European and Aboriginal elements. House of Commons: The Canadian House of Commons, modelled on the British House of Commons. Its members (referred to as Members of Parliament or MPs) are elected and the principle of representation-by-population generally prevails. Legislation dealing with expenditures or taxes can only be introduced in the House and the House of Commons has, at the end of the day, pre-eminence over the appointed Senate. The government is, in principle, based on the party that has elected the largest number of members. That party is referred to as the “governing party;” ministers — including the first minister, or prime minister — are appointed from the ranks of the majority governing party and constitute the executive council, or cabinet. imperial federation: A proposal to restructure the British Empire along federal lines, creating a more equal partnership in place of a colonial relationship. This idea gained a significant and influential following in Canada in the 1880s and 1890s. medicine line: Reputedly a Plains Aboriginal term for the 49th parallel boundary between the British-Canadian Plains and the American west. peace, order, and good government: A phrase from Section 91 of the British North America Act, 1867, and sometimes abbreviated to POGG. This is the residual powers section of the Act. Section 91 states that, beyond what is clearly allocated as provincial responsibilities and federal responsibilities, anything otherwise necessary to the “peace, order, and good government” of the country is to be handled by Ottawa. provisional government: Generally, an emergency or interim administration. In the case of Red River (Manitoba) the government established under Louis Riel’s leadership when the Council of Assiniboia dissolved and before the Canadian administration was able to legitimately seize power. residual powers: Responsibilities not clearly demarcated and described in the constitution. In a federal system the residual powers typically belong to the central government. This was the intent of Section 91 of the British North America Act. Seventy-Two Resolutions: Also known as the Quebec Resolutions, the proposals drafted (mostly by Macdonald) at the Quebec Conference in 1864. These were forwarded to Britain where they were further refined at the London Conference of 1866. They formed the outlines of the federal constitution as presented in the British North America Act of 1867. What motivated Canadian politicians to explore a federal arrangement? Why were the premiers of the Atlantic colonies interested? If federalism was the answer, what was the question? To what extent was Confederation a British idea? What was the role of the United States in advancing the cause of colonial union? How did Rupert’s Land figure into the dialogue about Confederation in 1864-67? What were the sources of opposition to Confederation? How were they addressed? Why did Nova Scotia and New Brunswick both eventually agree to join Confederation? Why did Prince Edward Island and Newfoundland elect to stay out of Confederation in 1867? What were some of the main features of the proposed federal union? What was the response of westerners to Canada’s annexationist move? In what ways was Canada in 1867 a society poised on the brink of change? Ajzenstat, Janet. “Human Rights in 1867.” In Canadian Founding: John Locke and Parliament, 49-66. Montréal & Kingston: McGill-Queen’s University Press, 2007. Smith, Andrew. “Toryism, Classical Liberalism, and Capitalism: The Politics of Taxation and the Struggle for Canadian Confederation.” Canadian Historical Review 89, no.1 (March 2008): 1-25. York Boat by Verne Equinoxis used under a CC-BY 3.0 license. A painting from life by Karl Bodmer by El Comandante is in the public domain. 14.8 Summary by John Douglas Belshaw is licensed under a Creative Commons Attribution 4.0 International License, except where otherwise noted.